Get YouTube Red Background Playback for free on every android device including Nougats, marshmallows, lollipop and KitKat. YouTube is the most popular video sharing website that has come to stay. While the platform serves not only as where you can enjoy and stream your favorite videos, there are also tons of good quality music that you can stream online over there. 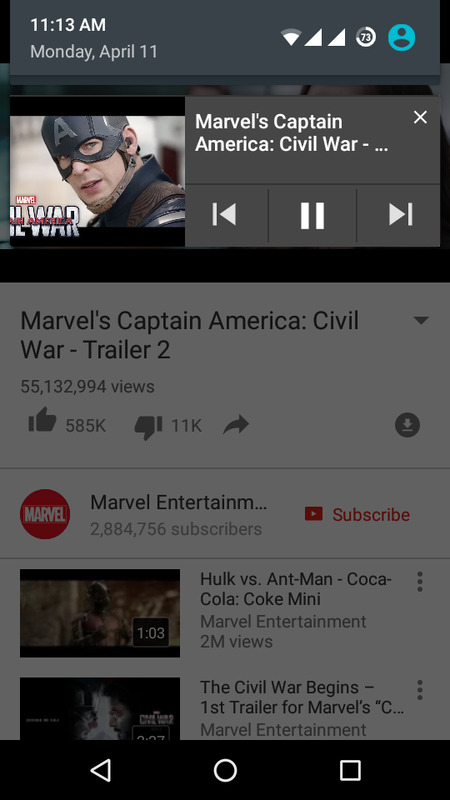 Billions of people’s uses YouTube to watch there favorite trailers, albums and captivating videos in other to kill time. However there are certain limitations which can prove to be a hindrance while trying to unleash YouTube capabilities and experience. By default, the official YouTube application does not allow you to play YouTube videos in the background or via the notification panel on your android device. But there’s a catch here!. The YouTube red which was introduced by Google comes loaded with extensive features everyone would love to have. While using the YouTube red, you can painlessly enable background playback and ad-free video streaming. However this feature is not available for Free. But you can enjoy it if only you’re willing to pay an absurd amount of $9.99 per month for a YouTube Red subscription. Unfortunately, YouTube Red is available only in the US and other specified country’s such as Korea and if you are from other country you’ll need some procedure to help you enable the Youtube background playback totally for Free. Yes! Free.. The YouTube red doesn’t offer much value to the amount it’s charging but there’s a way to get this feature without paying a dime. If perhaps you have a YouTube Red subscription, simply go to the app Menu->Settings->Background Play and select “Always on” to always play videos from the background. Now if you’re running android KitKat, lollipop and marshmallow, you can enable this feature by using an xposed module. However it’s too bad that xposed team hasn’t extended it’s support on android Nougat device. But there’s also a way to enable the YouTube background playback on nougat users. This procedure will strictly be for the android device running the above stated versions. Thus if you’re using the android 7.0 Nougat update, simple scroll down and read the brief steps to enable this feature on your device. We’re going to use an xposed module to achieve our aim here. 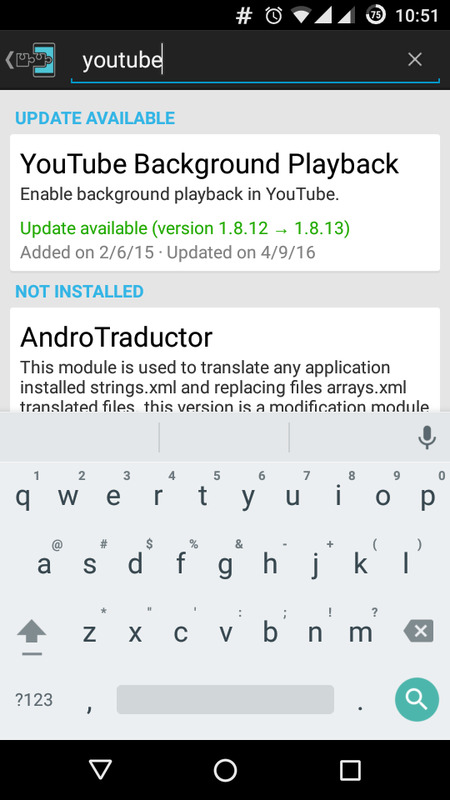 YouTube background playback is an xposed module that enables background playback in YouTube and playback control via notification. 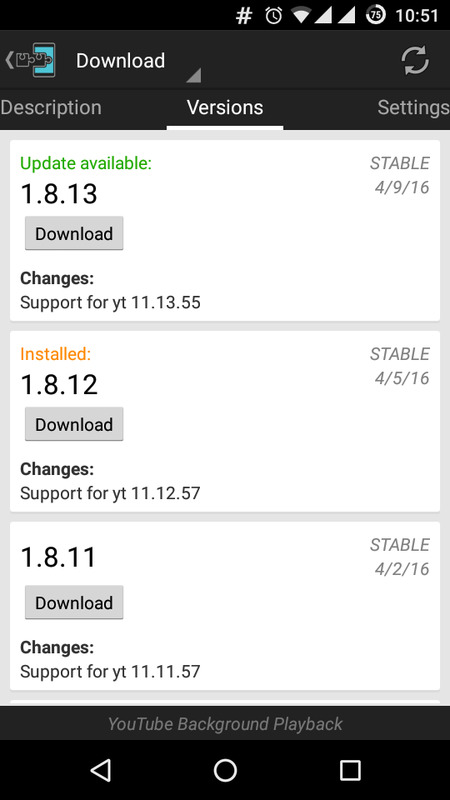 Thus to begin with, head over to the xposed framework on your device and jump into the “Download” section. Now search for “YouTube Background Playback” and hit on the result. From there, painlessly swipe your device screen over to the “Version tab”. Then hit the ” Download ” button. Make sure you download the latest version of the module, because when Google updates the YouTube red, there’s a likelihood that you need to update the module to to the latest version in other to stay updated with the newest features. Now once the download is completed, simply “Install” it. Once the installation process is “Done”, you’ll get a notification from xposed informing you that the module hasn’t been activated yet and that a reboot is needed. So enable it and perform a reboot or rather navigate back to xposed installer and tap on “Modules”. Then tick the YouTube background playback option and navigate back again to the homescreen. Now tap the “Framework” section and perform a soft reboot in other to activate the module. Now once your android device has rebooted successfully, there actually will be no further setup here. Thus from now on, whenever you’re playing a YouTube video, you’ll notice that there aren’t any ads. 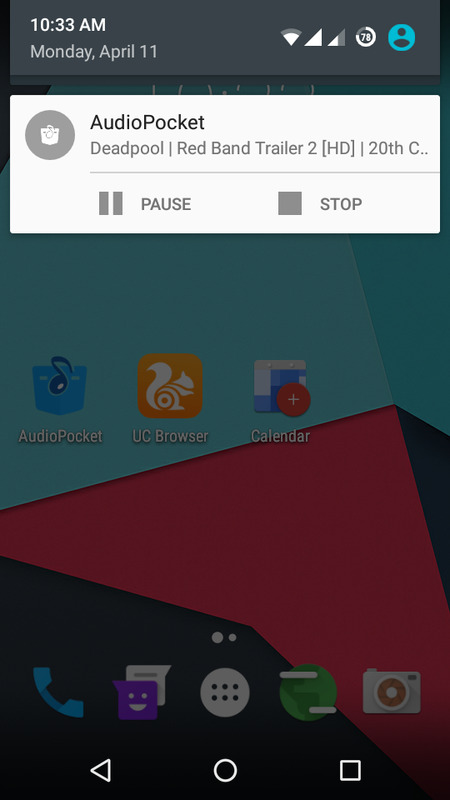 And on top of that, if you minimize yourandroid device, the audio or video playback will continue in the background and you’ll see it also on the notification panel without any hassle. 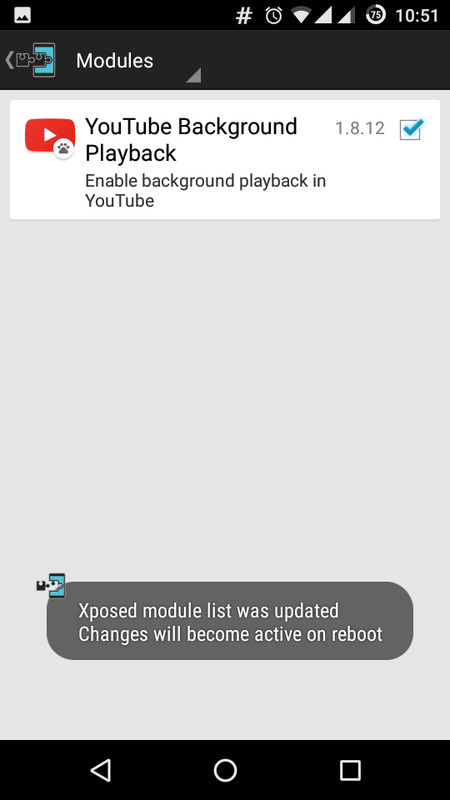 While the xposed installer team over at XDA developers are still trying to extend support for xposed on android nougat, there’s no need waiting for them since you can enable the YouTube background playback on your Nougat device by patching the official YouTube app on your android. Follow the below procedure..
First download the Lucky Patcher app on your android device from the link we’ve provided above and install it. Now you need to enable “Unknown Sources” from your device settings before installing the app. 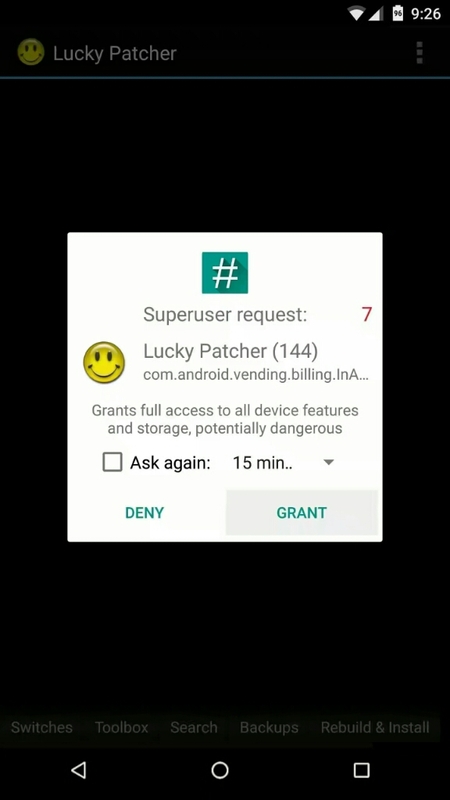 Once installed, locate and launch the app from your app drawer, and a popup will appear requesting for SuperSU permissions. Grant it. In the Lucky Patcher app, you’ll see the list of installed apps on your device. 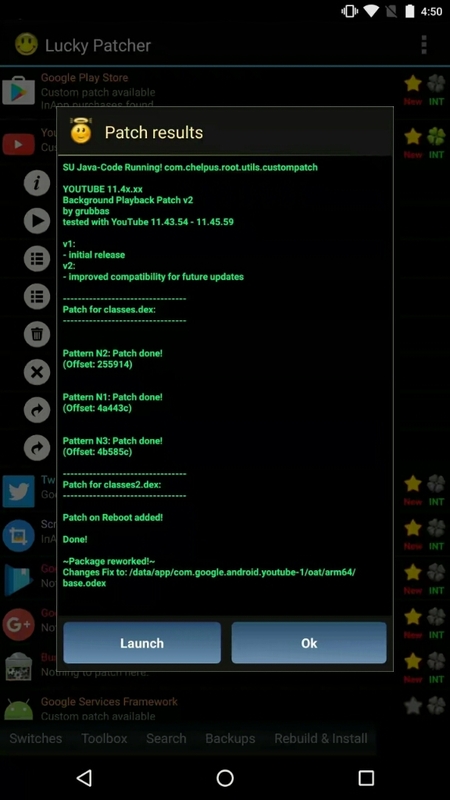 Now select the “YouTube” app from the list and hit the “Open menu of patches” option. You might get a system application warning if YouTube is installed as a system app, so hit “Yes” if prompted. 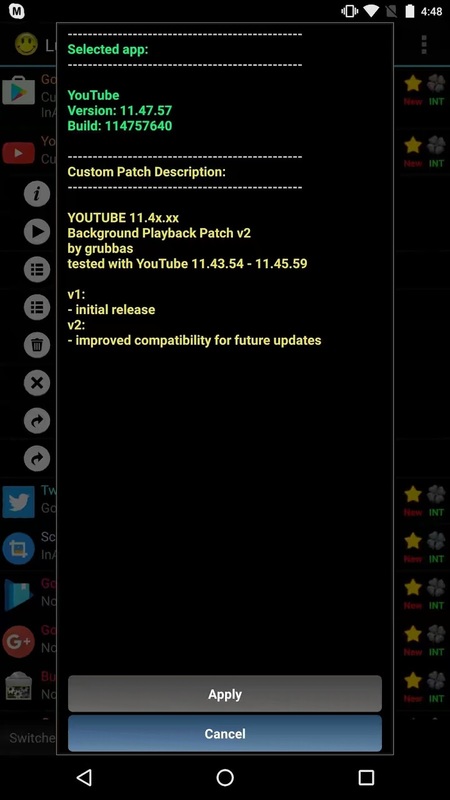 Then tap on the “Custom patch” and hit “Apply” to patch the YouTube app on your device. It’ll take some time to patch the app, so wait patiently until you see a success message. That’s it! You’ve patched the YouTube app. You can also apply other patches which can help to remove ads on the YouTube app. Thus explore lucky patcher and you will see this option available to be tinkered. Now, open the YouTube app and play a song or video, then hit the home button to minimize the app. You’ll soon see a “YouTube background playback” notification in the notification bar with options such as pause, play, previous, and next buttons. Now you can enjoy your favorite music or videos on YouTube in the background without paying a a dime as subscription fee. The YouTube Red has proved to be a feature worth upgrading. Imagine playing a song and performing other various task on your android device without worrying of any buffering. This feature is definitely a “dope” and is worth having. By following either of the above guides, you can now play all your favorite YouTube videos or music in the background of your android device.